Drawing on the beatitudes, the experiments of King Solomon in Ecclesiastes, and many other Scriptures, Count Gasparin formulated how God gives happiness to people. Gasparin states that happiness is a product of redemption only. Holiness is happiness and sin is misery; therefore, true happiness only starts at conversion because of mankind's total depravity. From there happiness is lived out through obedience, accomplishing God's work given to us, as well as prayer and dependence. Happiness: Discourses Delivered at Geneva by De Gasparin, Agenor was published by Curiosmith in January 2016. 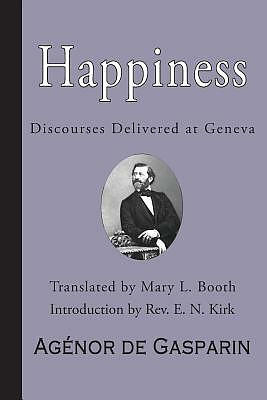 The ISBN for Happiness: Discourses Delivered at Geneva is 9781941281611. Be the first to review Happiness: Discourses Delivered at Geneva! Got a question? No problem! Just click here to ask us about Happiness: Discourses Delivered at Geneva.